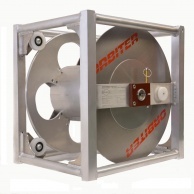 ORBITER delivers two different systems of cable drums, both optimised for fibre technology. The scalable PV system consists of twenty-two sizes. The CABLE CUBE is delivered in one fixed size, specifically dimensioned to take up to 300 meters of 9,2 mm SMPTE 311 cable. The PV system is an extremely sturdy but light weight aluminium tube design comprising of 22 sizes, resulting out of 3 different grates - variably equipped with two different core diameters. Height and depth of the cable reel is always constant, the width, which is measured parallel to the rotating axis, is customised. This scalable system allows delivering the PV drum series according to given parameters of given cable length and diameter, keeping them as small as possible to save storage room. low total costs by an extremely long lifetime sametime reducing costs for repairs of cables and connectors by their protection as confirmed by longtime customers. 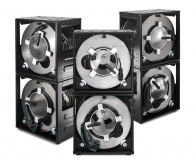 The Cable Cube is a more cost efficient, light but still very rigid, integral monocoque aluminium body housing. It is manufactured in one fixed size, tailored to match most common cables lengths and diameters for outside broadcasting applications. It is specifically dimensioned to take up to 300 meters of 9,2 mm SMPTE 311 camera cable. Both systems can be stacked safely and have handle bars to be carried comfortably. Orbiter cable reel systems strictly strive for best possible quality to achieve extreme longevity resulting in low total costs of ownership.